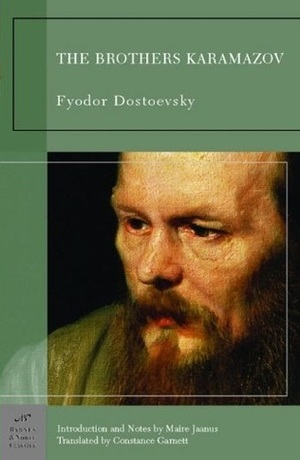 The Brothers Karamazov, by Fyodor Dostoevsky, is part of the Barnes & Noble Classics series, which offers quality editions at affordable prices to the student and the general reader, including new scholarship, thoughtful design, and pages of carefully crafted extras. Here are some of the remarkable features of Barnes & Noble Classics: All editions are beautifully designed and are printed to superior specifications; some include illustrations of historical interest. Barnes & Noble Classics pulls together a constellation of influencesbiographical, historical, and literaryto enrich each reader's understanding of these enduring works. The last and greatest of Dostoevsky’s novels, The Brothers Karamazov is a towering masterpiece of literature, philosophy, psychology, and religion. It tells the story of intellectual Ivan, sensual Dmitri, and idealistic Alyosha Karamazov, who collide in the wake of their despicable father’s brutal murder.Into the framework of the story Dostoevsky poured all of his deepest concernsthe origin of evil, the nature of freedom, the craving for meaning and, most importantly, whether God exists. The novel is famous for three chapters that may be ranked among the greatest pages of Western literature. Rebellion” and The Grand Inquisitor” present what many have considered the strongest arguments ever formulated against the existence of God, while The Devil” brilliantly portrays the banality of evil. Ultimately, Dostoevsky believes that Christ-like love prevails. But does he prove it?A rich, moving exploration of the critical questions of human existence, The Brothers Karamazov powerfully challenges all readers to reevaluate the world and their place in it. Maire Jaanus is Professor of English and department Chair at Barnard College, Columbia University. She is the author of Georg Trakl, Literature and Negation, and a novel, She, and co-editor of Reading Seminars I and II, Reading Seminar XI, and the forthcoming Lacan in the German-Speaking World.